In 1984, Philadelphia was feeling the first effects of a drug epidemic that would turn whole sections of the city into virtual post-apocalyptic wastelands. One of the symptoms of decay was a rampant graffiti movement that, despite the artistic skills it required, was considered an eyesore. 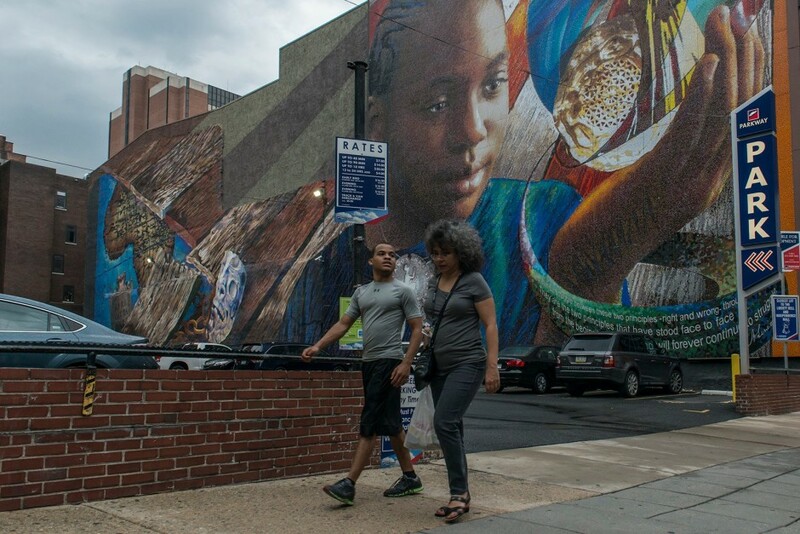 In response to the unwelcome public art, muralist Jane Golden was hired as part of the Philadelphia Anti-Graffiti Network. Her job was to meet the graffiti writers and find a more constructive way to channel their efforts. Thirty years later, there’s no missing the fruits of Golden’s labor. In the time since, the Anti-Graffiti Network was restructured into the Mural Arts Program and has helped put up over 3,600 designs across the city. 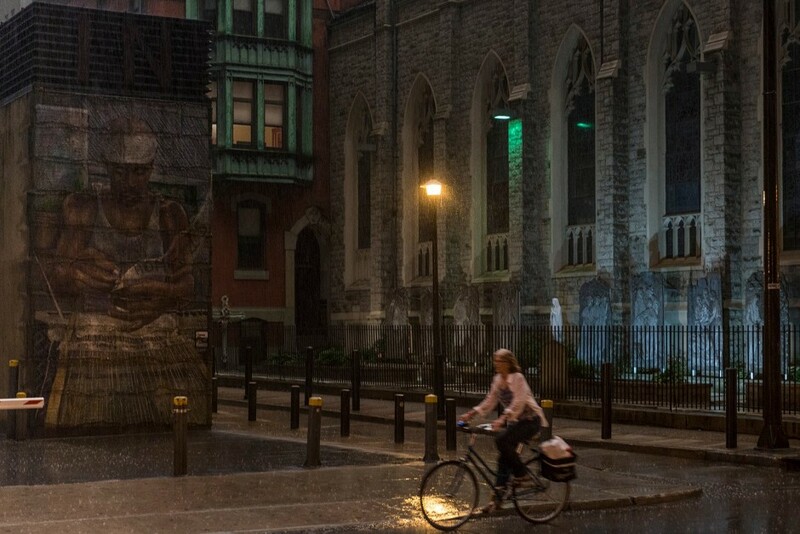 Walking through Philadelphia amounts to a stroll through the world’s largest outdoor art gallery. 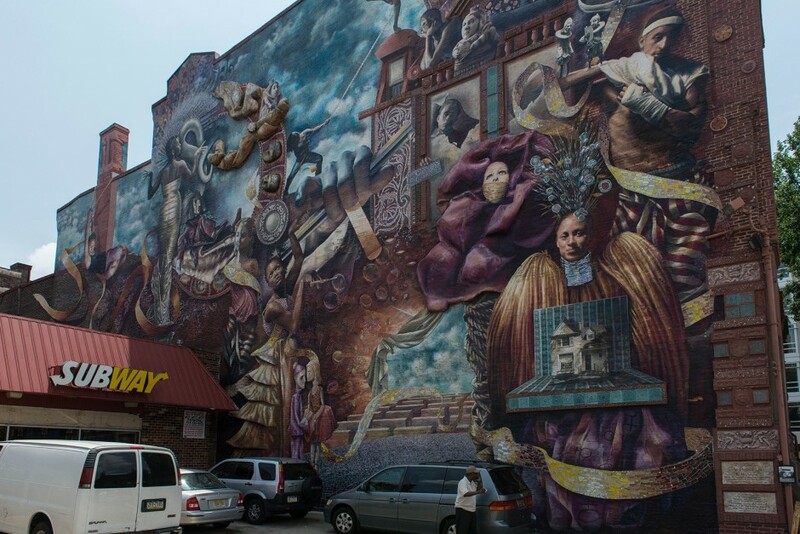 From prominent locations next to city hall to anonymous alleys and side streets, the murals are a proud and ubiquitous piece of the city’s cultural identity. Their themes reflect everything from a beautiful spring day to the horrific transatlantic slave trade. The murals are not only valued for their aesthetics, but are also expressions of civic consciousness. They display the spirit of neighborhoods and not-so-distant histories that have shaped the current urban experience. 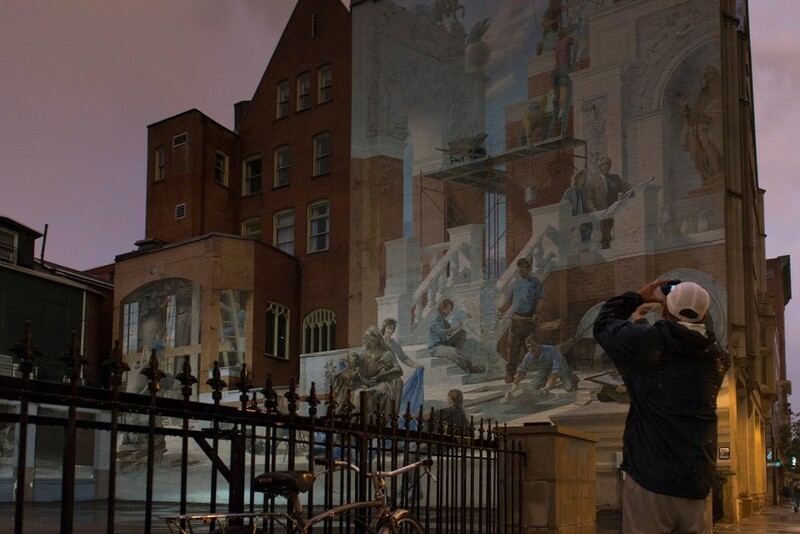 The following images were taken along the self-guided Mural Mile tour. Legacy is one of the world’s largest Venetian glass mosaics. It was created with the help of 40 prisoners serving life sentences in Pennsylvania’s largest maximum-security prison. The theme focuses on the transatlantic slave trade and alludes to the lives of the prisoners who live in shackles. 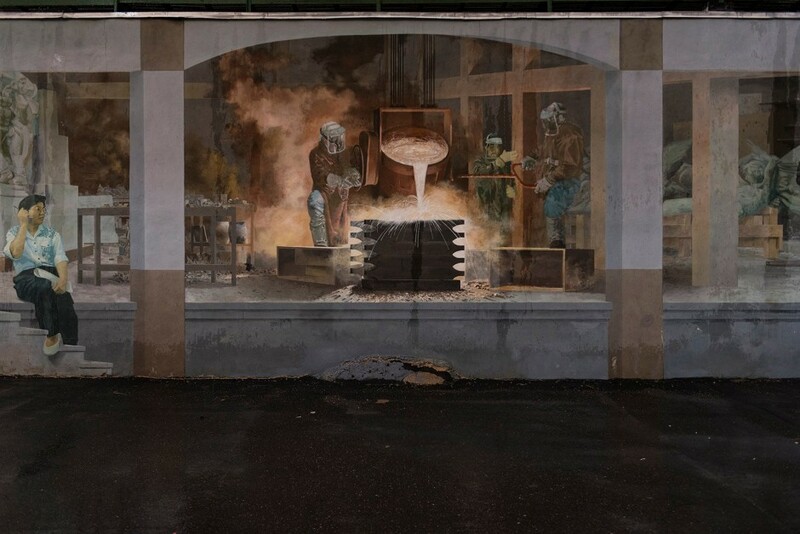 The mural offered a way for some who had been removed from their community to make a positive impact on civic life. 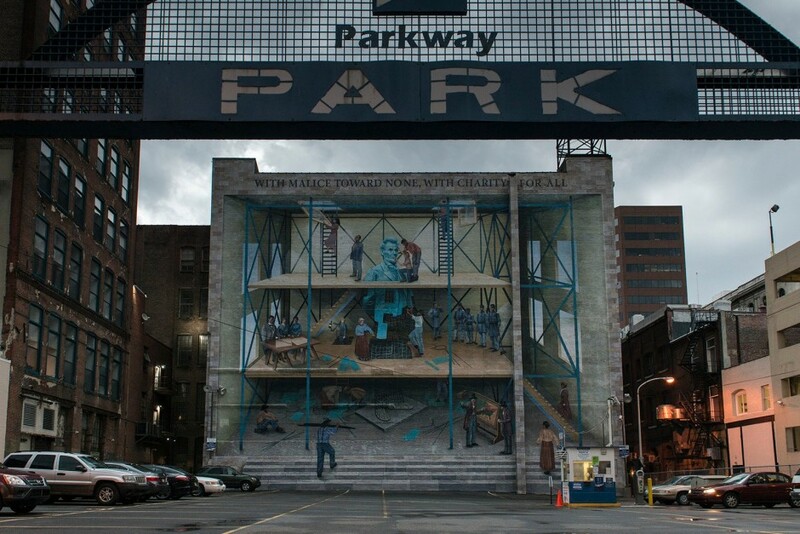 This mural pays homage to the path toward racial equality set into motion by Abraham Lincoln. At the center is an under-construction statue of the 16th president. At the lower and less-complete portion are the dark days of slavery and segregation. At the higher levels you can see a more complete structure and figures demonstrating interracial cooperation. The final level is beyond our view, but it suggests a world of true equality. Tree of Knowledge is in one of the most prominent locations in all of Philadelphia, sitting just yards away from the massive French Renaissance-style city hall. The mural is in commemoration of the Eisenhower Fellowship. Hidden in the tree are items such as the scales of justice and carpenters’ tools, meant to represent the values of the fellowship. 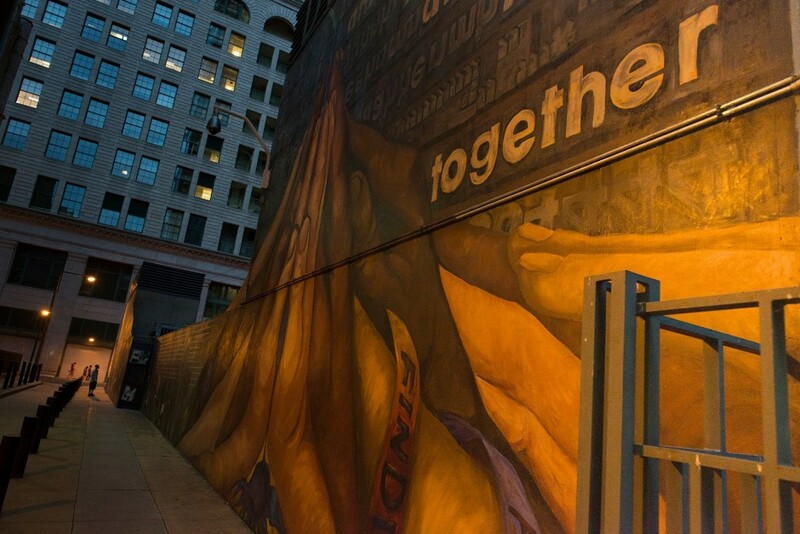 This section of Finding Home depicts many hands coming together in the same manner as the community that came together to create the mural. 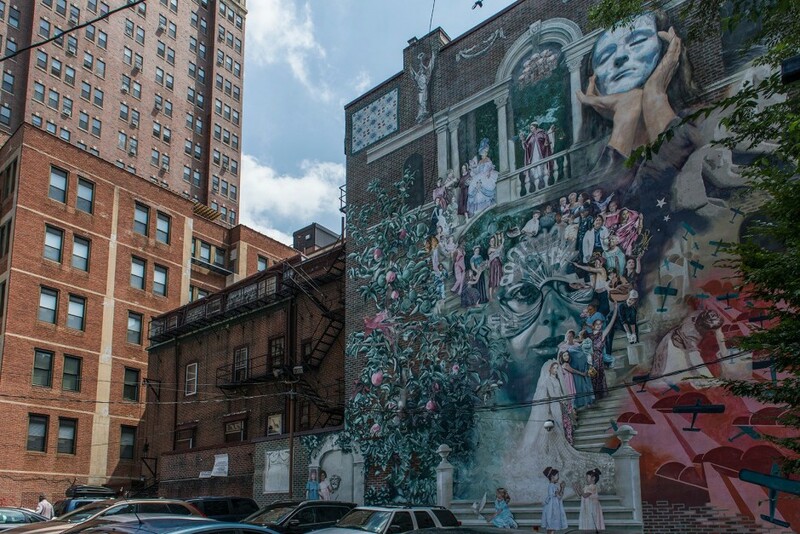 This mural is painted on the side of a historic building on Moravian Street. It was commissioned by Jim Beasley, who also restored the structure, turning it into offices for his law firm. 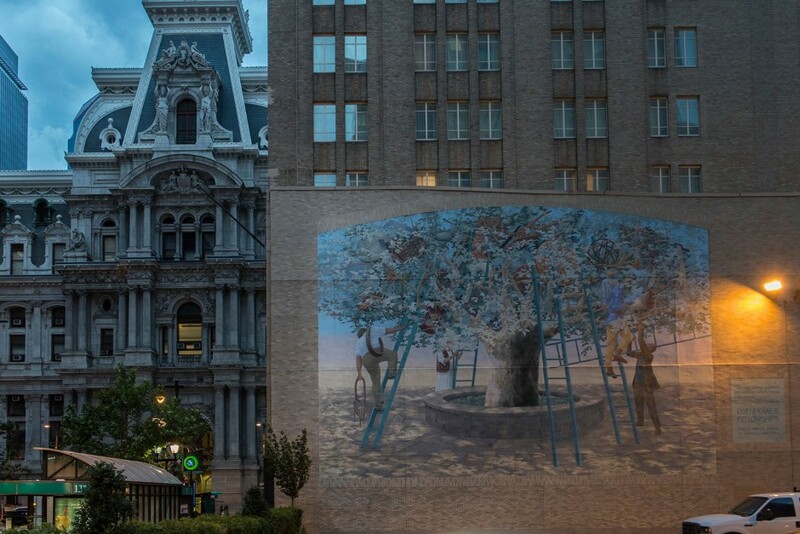 The mural itself is a tribute to Philadelphia architecture. Painted in the mural are Michael Webb, Jim Beasley, and their children. In this portion of the mural, workers are pouring steel, the critical material in Philadelphia's skyscrapers. In the background is a rendition of the William Penn sculpture that sits on top of city hall. Painted along the side of the New Century Guild, Women of Progress depicts the change in work and gender rolls of women. Included in the painting are Anne Preston, one of America’s first female doctors, and Sarah Hale, author of Mary Had a Little Lamb and editor of one of the first American magazines marketed to women. 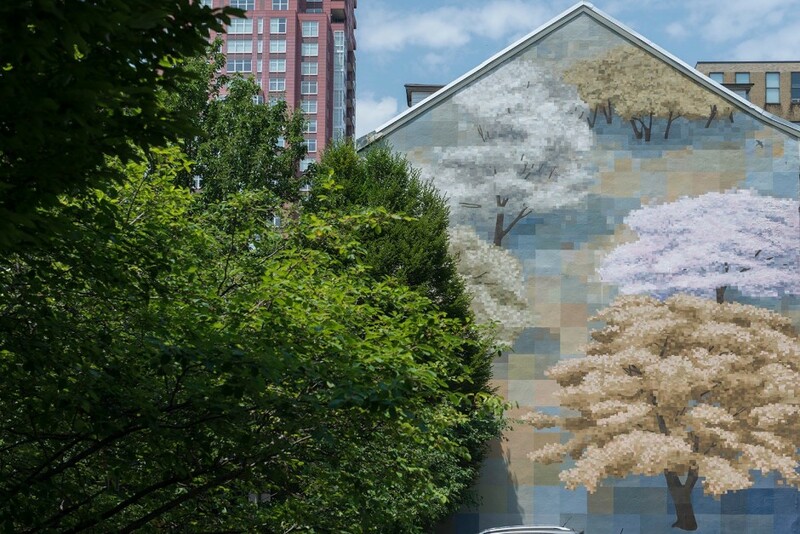 Artist David Guinn simply wanted to extend spring for the Bradford pear and dogwood trees around this mural. The concept came from a spring day that the artist did not want to see end. Made from glass tiles, marbles, and concrete, Theater of Life is the first 3D mural in the area. The different characters represent the many different roles we are all required to play during our lives. The larger hands relate to control and the woman with scissors is poised to cut the strings that control us.